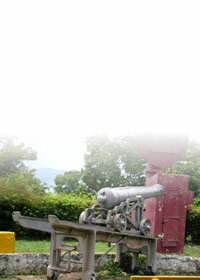 The Jamaica Railway, constructed in 1845, was the first line opened to traffic outside Europe and North America. The rail service was established in the United Kingdom in 1825, the United States in 1830 and Canada in 1836. Not only did the Jamaica Railway have the distinction of being constructed so soon after the first public railway in Britain, but also, it was the first constructed in the British colonies. In 1843, a proposal to construct the railway line was made by William Smith and his brother David Smith to the House of Assembly in Jamaica. The plan to construct the double track line between Kingston and Spanish Town was favourably received by the Assembly and in the same year the Jamaica Railway Company was incorporated under the 7th Victoria cap. 25. 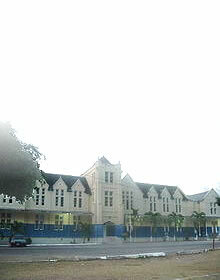 The railway stations constructed between 1845 and 1896 demonstrate the application of the Jamaica/Georgian style of architecture. It should be emphasized that although most of the stations were constructed as part of a major line extension, their individual form and features show great variety. Today, most of the stations are in a state of disrepair. Some are now used as bars, grocery shops or residences. Many stations have alterations made to their original form, nevertheless the original design features remain intact. Anchovy Railway Station - is a two storey Jamaica/Georgian timber structure. Appleton Railway Station - is a two storey Jamaica/Georgian timber structure. Balaclava Railway Station - is a Jamaica/Georgian two storey building constructed of timber throughout. Bog Walk Railway Station - consists of a simple two-storey timber structure. Cambridge Railway Station - is a two-storey timber, unique Jamaica/Georgian style building. Catadupa Railway Station - is a two-storey Jamaica/Georgian timber structure. Four Paths Railway Station - is a two-storey concrete building. Greenvale Railway Station - is a two-storey Jamaica/Georgian timber structure. Linstead Railway Station - boasts a very simple Jamaica/Georgian style of architecture. Montego Bay Railway Station - is a simple timber building. Montpelier Railway Station - is a uniquely two-storey designed Jamaica/Georgian style of architecture. Old Harbour Railway Station - is a two-storey Jamaica/Georgian structure. Orange Bay Railway Station - demonstrates Jamaica/Georgian features. Riversdale Railway Station - is a two storey Jamaica/Georgian timber building. 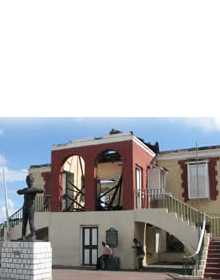 Spanish Town Railway Station - is a Jamaica/Georgian style brick building set on a stone base. Suttons Railway Station - is a Jamaica/Georgian timber house set on a stone base. Williamsfield Railway Station - has elements of the Jamaica/Georgian architectural style.